Over this past week, the heavens have rained down abundant blessings upon me. My fledgling business acquired some important new clients, my nephew drew this great picture for me to hang in my new apartment, and my book, THE AUREATE SPECTACLES, by Inkitt managed to hit the top 100 bestsellers list. Being one who always wants to give back, I had to put some thought into what ought to be done...and then it came to me: I was going to do 100 good deeds in one week! It turns out that it's quite easy to do 100 good deeds, in fact, I'd say most of us do that without even realizing it, which in my opinion is the top miracle of all: we're surrounded by greatness. As many of you know, I am a bit of a hermit—socially speaking—but as of late, I have felt the desire to break free of my eremitic tendencies, that I might accomplish some good in the world and perhaps make a few friends along the way. While pondering this seemingly mountainous endeavor, an idea of stupendous proportions clobbered me right in the forehead, and being the spontaneous animal that I am, my plan was executed within a few short weeks. 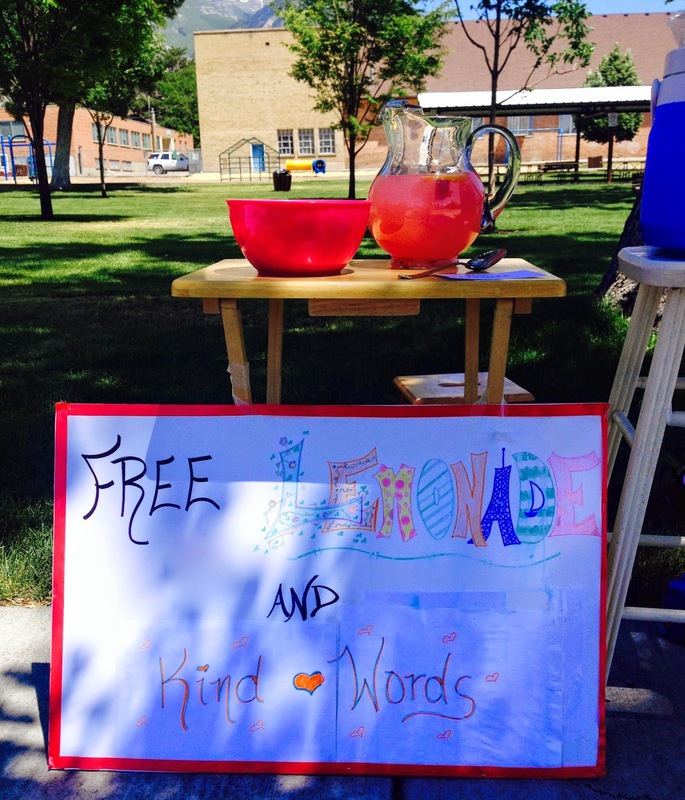 "Free Lemonade and Kind Words"
I spent the next morning whipping up different batches of flavored lemonade: Lemonade, Pink Lemonade, Strawberry Lemonade, Tart Lemonade, etc., and also cut up lemon slices and strawberries for people to add to their drinks. I had a spot in the park all picked out in my mind, and along the way, stopped to purchase some ice and a big sun hat, but as I made my way to the check out stand, a six pack of bubbles on sale beckoned to me. How could I resist? It was an inspired buy. After two long hours in the park of my own neighborhood, only one visitor had graced my stall: a guy from the bus station who obviously took pity upon me and drank six glasses of lemonade just to please me—which in my head seemed sure proof of my lemonade's superior quality. At one point, a dark blue van filled with a wild brood of children drove by. They waved and shouted and I thought this could be it, but the driver never even slowed. 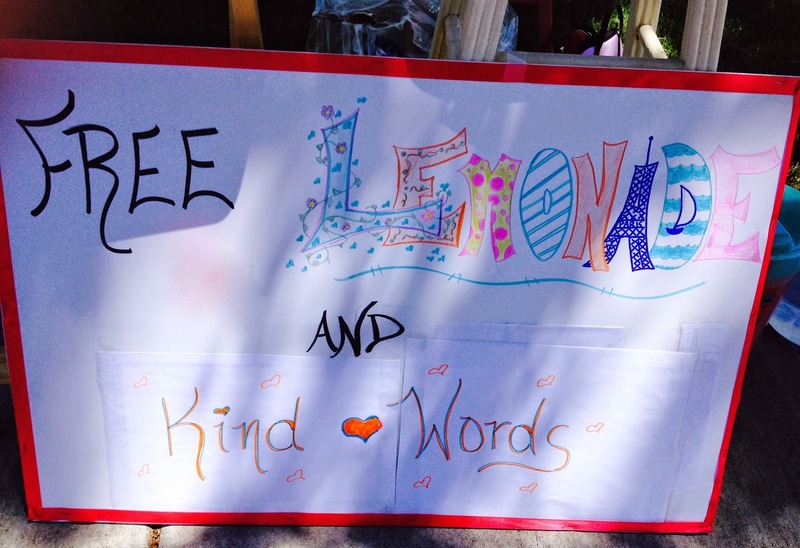 It seemed I had chosen an area of town where few people had need of free lemonade or kind words, though I did get some curious smiles from drivers as they passed by. I also left the bubbles on the table for any takers. Before I had even made it around the first corner, some bikers had already stopped to partake, which gave me a small sense of self-congratulatory accomplishment. Down the lane a bit, I lounged on some thick tree roots and soaked my feet in the river. The water was nice and cool and the breeze lulled me to sleep under my giant sun hat. A while later, when I awoke, I found that I was covered in a light sprinkling of fluffy white stuff, which drew my eyes to the skies. To my great delight, the air was filled with whiffling flutters, a gift bestowed by the shedding of the cottonwood trees. It was a snowstorm befitting such a splendid June day. After marveling at its beauty, its seemed best to go and check out the situation with my lemonade stand, lest the poison control squad arrive with many lengthy and unpleasant questions. Upon rounding the last bend, a magical sight loomed before me. The small clearing next to the river was filled with bubbles, floating up to meet the descending white flutters. 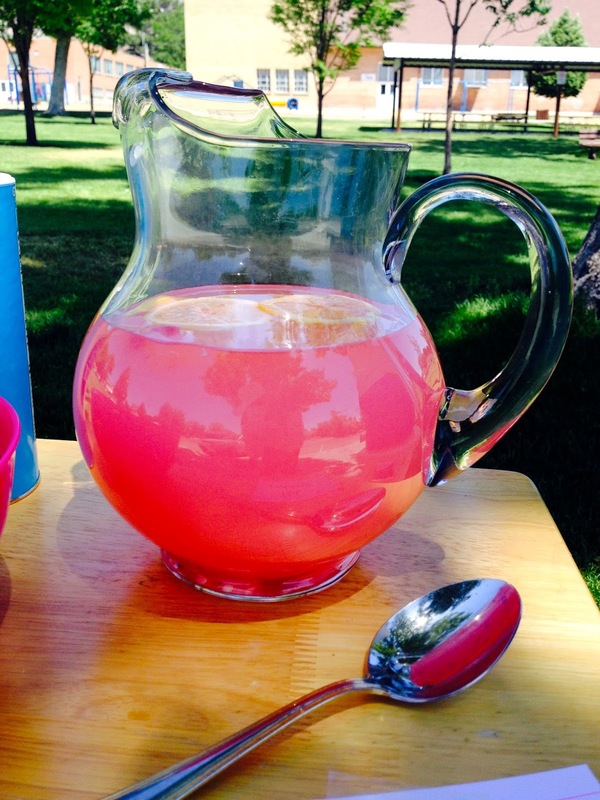 Children's laughter rang out in pure mirth, while two parents refreshed themselves with liquid pink sweetness. Unwilling to spoil this family's moment, I slid behind a tree and waited patiently for them to finish. My heart swelled with joy and my success could not have been more complete. Although my day had not gone as expected—me, the assumed champion of keen and discerning comments, uplifting the masses—I had received something much greater in the wondrous miracles of the day: the enchanting flutters of the cottonwood trees, the loveliest nap a girl could ever ask for, and the euphoric squeals of small children chasing the uncatchable bubbles. Never was such happiness to be found anywhere. As always, the would-be uplifter became the uplifted. Free Lemonade. Check. 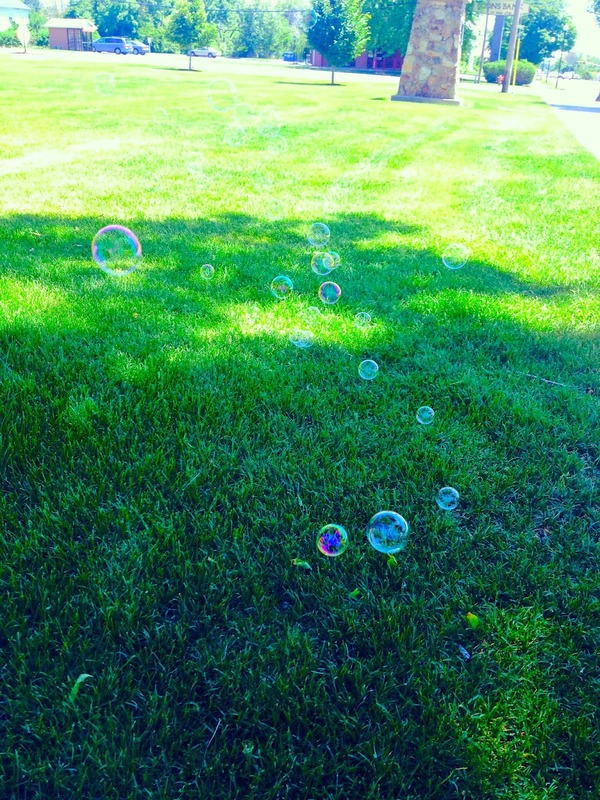 Free Bubbles. Double Check. Those were the words of my heart. How many times had everything inside of me shouted those words! They appeared to have burned through the decay in a desperate plea to be heard before it was too late, before the ever-creeping blanket of rust could swallow the carriage whole. I thought of a time when my younger brother arrived home on a Saturday, downcast, because his friend, Henry, had purposely excluded him. It was not the first time this had occurred, and my ten-year-old sense of justice simply could not brook any more unpunished bad behavior. I was going to "fix" things. Hastily, I transformed my bunk bed into a prison cell, then proceeded to lure young Henry to the prepared location — employing every disreputable method of deception my decade of experience could procure, including fibs and even a touch of physical force. My dad had an ancient set of handcuffs, which I used to secure him to one of the posts, where I left him to rot for what seemed a whole day, but was really an afternoon. I fed him bread and water — as they did in the movies — and at the end of his sentence, lectured him long and hard about his crimes. As Henry left, his dejection was evident, and even though I felt he deserved it, my victory was quelled by a befuddling sense of wrong-doing. He was too young to comprehend what I was trying to accomplish. I was just a mean girl who locked him up for something he didn't understand. I did my best to revive his spirits, but he just stared at me with these vacant, troubled eyes, and I knew that Henry understood with absolute clarity that I had intentionally hurt him. 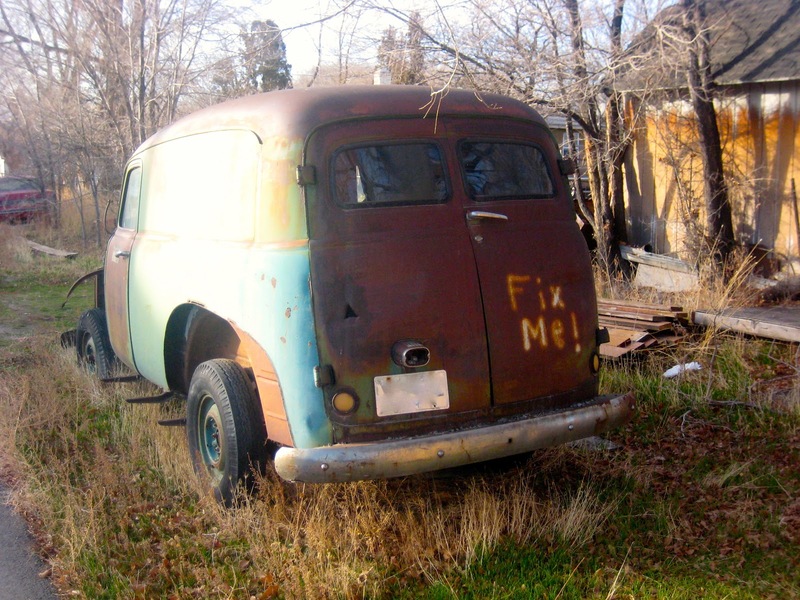 My fixing hadn't gone well. The old adage teaches us that people don't always remember what we said or did, but they always remember how we made them feel. Just a few days ago — and many years later — as I was on my way home home, I noticed a young man sitting on a park bench. His head was in his hands and the very position of his bodily stance advertised a forlorn state. My inner-radar detected a clear distress signal, and one that couldn't be ignored or justified by the flippant excuses of a rushed society. Once again, of its own accord, my car seemed to pull itself over, and I sat watching, unsure... after all, what was I to do? I had no words to fix him. Experience had taught me the value of listening to myself, and sooner than expected, I was out of the car and approaching the bench, where I casually sat down... and did nothing. I just sat there. After a few minutes, the solution suddenly came to me. I felt compelled to pat this young man on the back, which I did — gently, but surely. The young man looked up, surprised by my presence. His eyes reflected deep wounds. He looked at me the same way I had at the words on that car. After what seemed an age, he gave a subtle nod, lifted a hand, and offered it to me, and in a shaky voice — rife with emotion — told me his name... Henry. I shook his hand, and responded in kind, after which, we both got up and left. And that was that. Nothing more was needed. Though we were strangers, we spoke the common language of human understanding. All he needed to know was that someone, somewhere, saw him — really saw him, and in a small measure, shared his grief, whatever it may have been. Sometimes, the genuine concern of our hearts shines through and does all of the talking for us — thank goodness! In life, the fixing of other people is not a true option, and is, in itself, a sort of evil. 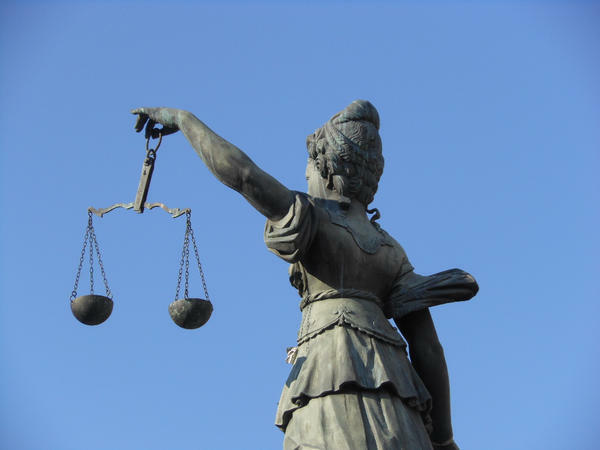 It takes away from the agency of others to choose how they will act and live, and denies the growth of character. The first Henry had no choice in his imprisonment, and the second had to choose to accept my proffered solace. A brave decision. 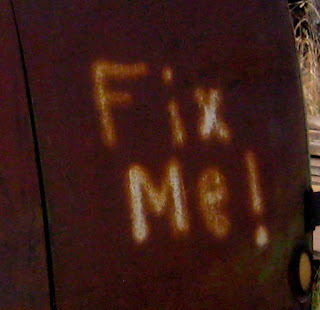 Though we cannot fix each other, we can offer the occasional tune-up by uplifting and refraining from harsh words, by seeing the good when the bad is so readily evident, and by the pouring-out of silent pep talks as each of us embark upon the great task of overhauling our souls. May we strive to be kind. *The names of the people in this post, though identical in real life, were changed for reasons of privacy. There is a beach in West Cork near Ownahincha known as the Long Strand. It's a deadly beach, famous for sneak waves caused by the quick, deep descent of its shifty sands. Surfers love this beach, as do I — not so much for the surfing, which I was never very good at, but for the cobbles spit from the frothy churn of those steely blue waters. One morning as I bumbled along the beach, the water was barely visible through a dense shroud of fog. I happened upon something singular and unexpected: a perfectly shaped skipping stone. The fog made it special, like I was in a private room, especially reserved for this hallowed bestowal — the ultimate gift wrapping. I picked it up and rubbed its smooth, flat surface between my fingers and thought of my older brother. We were riding bikes through the sweet smelling vineyards of Megier and came across a river where we stopped to cool off. I had never skipped a stone in my life until my older brother taught me that day. It was a memorable occasion, a time-honored passage of rites, and it was special. Little did I know that just a few days prior, he and my sister — whose favorite movie is Amelie — had an Amelie day, scootering around Paris, where they too skipped stones... c'etais la saison, Je s'pose. That morning the beach was foggy and the waters choppy, not exactly ideal conditions for skipping stones, so I tucked the rock safely into my pocket and continued along my way. A few moments later, I happened upon another one. It was just as flawless as the first; I couldn't possibly leave it behind... and an idea struck — subtle and enlivening. A gentle clinking reached my ears as the second stone landed in my pocket. I continued along my path, alert and searching, and every so often the sea-smoked room would gift me with another stone. I came across this another day at the same beach. Soon my pockets clanked as I moved, a human-powered wind chime, laden with enough ballast to ensure my drowning should a sneak wave attack; but it was a risk worth taking, for I had gathered stones sufficient to compile a most splendid gift. 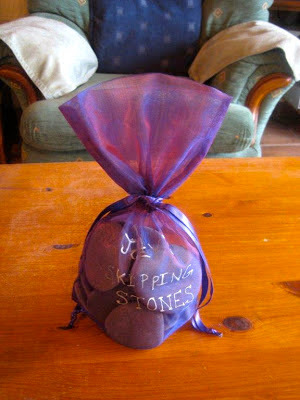 Upon returning to my beautiful, rented cottage near the Galley Head Lighthouse, I rinsed them up and set them out to dry on the stone-flagged patio while I searched for the perfect container. I found it in a bag that once housed a fancy chocolate Easter egg. 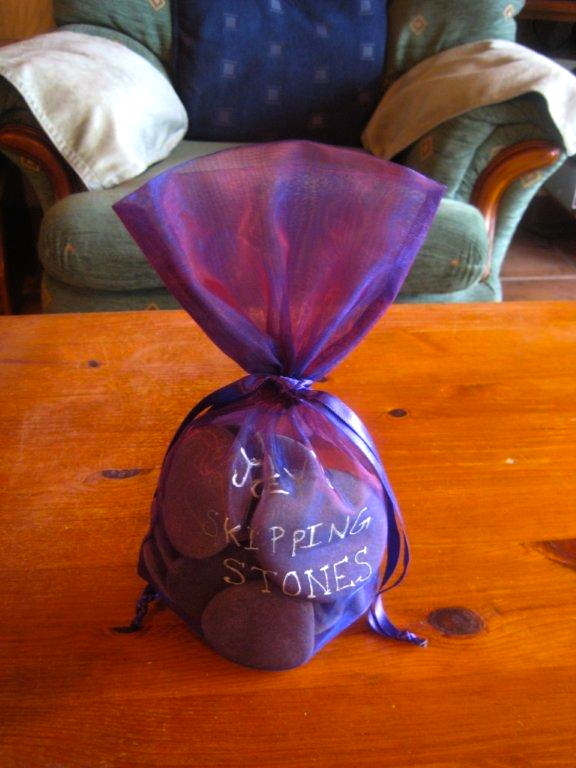 After the morning fog burned off and the roads were safe to use again, I peddled ten miles into town and purchased a silver paint pen, which I used to carefully inscribe the title of my gift: Joey's Skipping Stones. It was perfect and filled me with a deep sense of pleasure. Those significant stones were hand-entrusted from the sands of a most beloved Irish beach to the palm-studded shores of Southern California. A few weeks later I got a text from my brother citing that he loved his gift, but wasn't sure if he should keep them, skip them, or chuck them at the neighbors dog that forever barked in the morning. What an excellent response! It wasn't long before my nephew was born. I made certain to gather another bag of stones for him, so that someday my brother can teach his son the important lesson of skipping stones. A gift of generations. Perhaps someday when my nephew is on his own, facing tough life decisions, he will recall the much-needed advice imparted to him while skipping stones with his dad. If so, my life on this planet, will indeed, have been worthwhile. In the summertime, the Irish roads are lined with wild, yellow blossoms, king-sized daffodils to amaze the very tastebuds of delight. Those lovely masses trailed along the clover-splotched tarmac and became more beautiful with every curve in the road. I marveled at them wherever I went, and one evening, after returning home from the local library — yes, I had a library card in Ireland — my arms were loaded with books. I tossed them onto the sofa and declared: "I'm rich!" ...or unplugging the janitor's vacuum and leaving a cookie next to the socket for him to find. Listening to his shy laughter tinkling down the hall enriched my spirit as nothing else could. Suddenly, I was walking down an Irish causeway lined with thousands of golden blossoms in "sprightly dance." I was rich, and the feeling only compounded. When I was a kid, my sister wrote a poem about me, titled Bubbly, for a school assignment. The title speaks for itself, but I believe it is this re-emerged trait of mine, boiled down to the simple sobriquet "bubbly" that enables my soul to be rich. I wonder how many of us have buried our simplistic traits to the cost of our souls? Leonardo Da Vinci once said, "Simplicity is the ultimate sophistication." 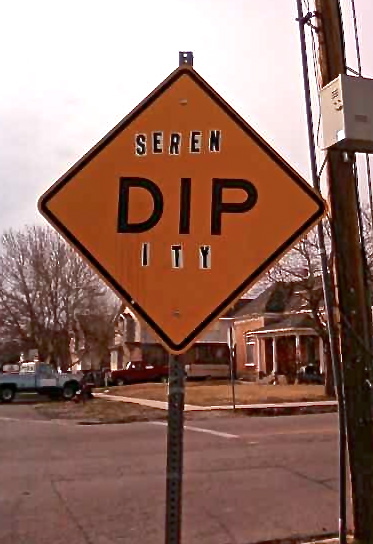 A couple of days ago, while driving, I happened up this sign: Seren-dip-ity, it said. A small thrill warmed through me, and ever sensitive to the power of positive suggestion, I was now on the look out for serendipitous events. Today, being Easter, I went to the graveyard to visit a friend who died in a car crash while I was still in high school. I had never had an opportunity to visit his grave before and it took me well over an hour to locate the spot, but I was grateful I took the time. I kind of thought he might have known I was there. Later in the evening, the fine weather once again seduced me out of doors; I fancied a stroll. Across the street from my house sits a school. I went over to plod along the track, which is situated on high ground to afford a nice view of the mountains. Upon approaching the track, something in the sky caught my attention. A bright red balloon — a Valentine's balloon — bobbling along at a leisurely pace. Curious to see what it would do, I walked toward it just as the balloon floundered and then stagnated in the air. Before long I was standing immediately beneath it, and I watched in amazement as the balloon descended gently before my eyes. My hand calmly lifted and clasped the tail, as if merely choosing a lollipop from the sweets aisle. This was a Valentine gift like no other, because it came from the heavens, and what better day to receive it than Easter Sunday? I thought of the dove descending upon our Lord near Jordan and my heart flooded with joy. 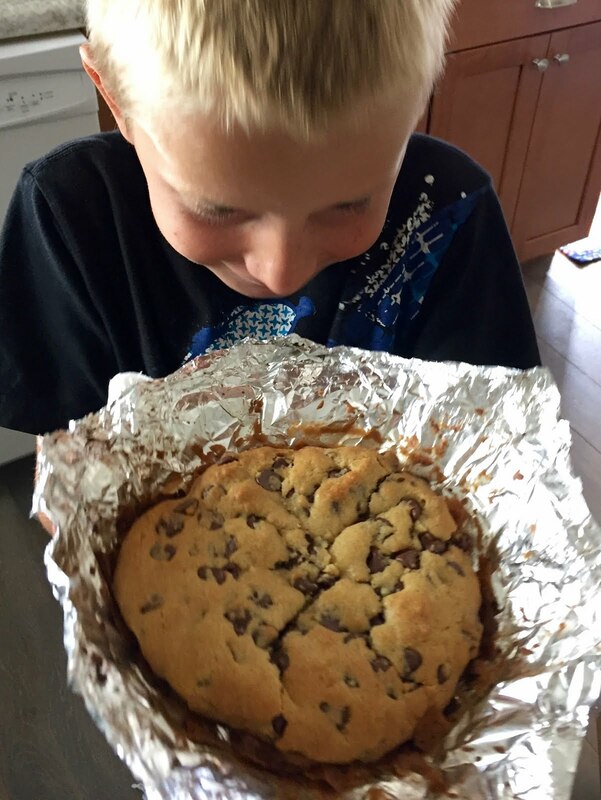 These are the moments that make life magical. As I pottered around the track, enjoying the sunset, the balloon trailing behind me, the smile in my chest expanded wider with each step. On my way home, I passed by the swing set and figured, Hey - why not? I liked the sound the balloon made as it flapped back and forth with the motions. I even took it for a quick zip down the slide before heading home. My older brother once taught me an all-important lesson about leaving things in a better condition than they were found, so I gathered up some bits of trash along the way and came across yet another amazing find: a Laffy Taffy wrapper. Hidden treasure was everywhere! I just love those silly little jokes, and this one happened to suit the occasion. Question: What flies and helps people? "Balloons from Heaven!" was my immediate thought. That, of course, was not the answer on the wrapper, which turned out to be: "A Helidoctor." Whether this special balloon was gifted to me from the heavens (which it obviously was), was a Valentine gift from my friend on the other side (which I like to think), or a sprinkling of serendipity from the heli-doctor (which I kind of doubted), it matters not. 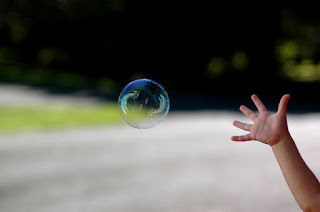 What matters is the ridiculous amount of pleasure I've received while writing this blog and watching that wondrous balloon dance merrily across my bed. Happy Valentines from a girl who believes in Easter miracles. In high school, an old boyfriend of mine used to tape notes to the bottom side of my desk for me to find in sixth-hour Physics class. I loved it. It was the pinnacle of my day, and because of it, I developed an ambrosial affinity for secret messages... and somehow, miraculously, managed to pass Physics. I recently went for a nature drive up by this mountain lake. Although it was frozen over, the weather was fine, and brought out more visitors than I would have expected. Wishing to be alone, I wandered down a path cordoned off to vehicles. Some small way down the path, I came across a camping area, complete with picnic tables, restrooms and a dumpster. I also encountered a sleeping bag — one that appeared to have been hastily abandoned. Mushroom stubs littered the area, and upon closer examination, it appeared they had been picked from the roots of a tree. Someone had to have been pretty desperate to scavenge for those. In my car, I always keep a 72 hour kit. It's pretty bare bones, but I figured even a few small items would be an improvement over those awful mushrooms. As I booked it back up the hill, the wind grew brisk. My ears began to ache from the cold and many of the fair-weather sightseers were driven away. I dug through my trunk and located the kit and found four ancient granola bars, an eighteen-hour candle, a small box of matches, some cough drops and a pair of earplugs... just in case the sleeping bag's owner also suffered from earaches. 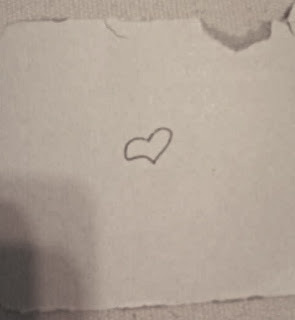 I drew a heart on a piece of cardboard and stuffed all of the contents into the baggie with the granola bars and made my way back down the hill, where I carefully folded the package into the sleeping bag. I wished I had better to give. A few days later, I decided to go back and check on things. This time I toted a lunch bag with sandwiches aplenty — plus a bit more; but I could see from a distance that the sleeping bag was gone. 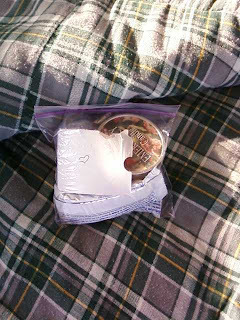 My heart kind of sank for a minute until I spotted something else: the baggie. I raced closer to make sure. It sat in the same exact spot as I had left it — minus the sleeping bag. A hole had been ripped in the bottom and the granola bars and ear plugs were gone. The candle had also been used, but only just. It had probably been too windy to stay lit. 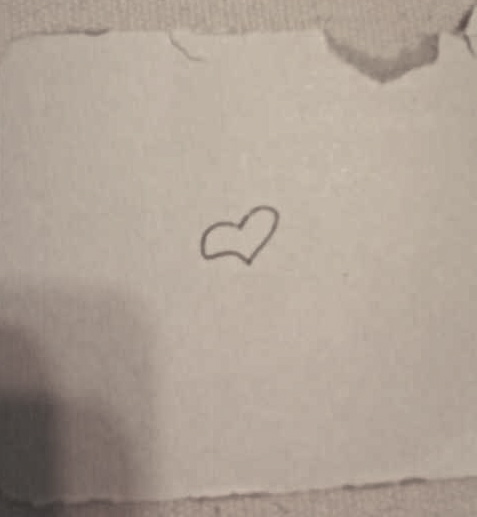 But the most important thing left behind was the heart I had drawn. It seemed to have been placed just so, as if to serve as a reminder — a beacon of sorts — in returning what wasn't needed to the rightful owner. An occlusion formed in my throat. It felt like a message under the desk. For many years now, I have lived with a broken heart — the kind that doesn't mend. I might always be alone, but I'm grateful for the lessons that have taught me to empathize with those of an isolated status. I'm also grateful for the lessons that have taught me to find companionship and solace in a remnant of a note I once wrote for someone else. I may or may not have helped someone, who may or may not have found value in it, and may or may not have left it behind for me on purpose... but I like to think they did, and I find joy in believing so. That's the trick of life: choosing joy. There are many notes under the table for all of us if we will but take the time to see them. It could be a quick text from a friend or a "thank you" from the grocery store clerk, or it could be as big as a peace-offering from a loved one. Don't let them pass you by. Heed the call. Find the messages. Be generous with your optimism. And always, always find the good in others.